Most freesat PVR recorders have dual tuners which require one or more cable feeds. Take up our services to extend your existing satellite dish or supply a complete upgrade for additional rooms or equipment. A SINGLE (1) surface mounted downlead cable (Bench marked type) up to 15m in length to a suitable position for connection to the onsite equipment (Digital STB/TV Receiver) - This installation option provides a single signal feed to one room only. The downlead cable shall be terminated in accordance with the STB specification using a durable crimp on ‘F’ type cable connector. A final assessment of received satellite services (freesat) will be carried out to confirm that the new service (coverage restrictions apply) is operational to agreed levels following the satellite dish system installation. The above is for a standard freesat installation which fits most household needs. Here are some non-standard freesat installation exceptions requiring a special quote. Here, at C & R Technologies, we are the UK wide (all postcodes covered) specialists in freesat installation. We can supply and install a suitable freesat installation to suit your requirements, whether you wish to receive standard definition viewing, or would like to receive the new Digital TV freesat HD channel line up, all for free. Remember, freesat HD has no monthly charges, subscription or minimum contract. You only pay for the equipment and your freesat installation. The Digital TV freesat HD system, as the name suggests, is free satellite Digital TV viewing for anyone who wishes to watch Digital TV. With over 140 channels including TV & Radio already available, and this is estimated to increase to around 200 free channels during 2009, freesat HD is the new digital vision for the future, and provides a superb alternative to Freeview or Sky Freesat. As opposed to the Sky Freesat system, you will not require a card to unlock the free channels, and the BBC has announced their system will remain free, forever. One of the most appealing features of the new BBC & ITV freesat HD system, is not just the fantastic channel line up already in place and to come in 2009, neither is it the free channels with no subscription or monthly payments, but it is the offering of HD picture viewing technology on its range of channels, direct to your television, ALL COMPLETELY FREE. High Definition provides up to 5 times greater picture quality than standard definition, with more vibrant colours and much finer detail. You will also benefit from improved audio, with some programmes being available in Dolby Digital Surround Sound as well. Providing you have a HD compatible television, and a Digital TV freesat HD receiver, you will benefit from the channel line up in glorious High Definition (HD), providing greater, sharper and much more detailed pictures and vibrant colours. Now, you can purchase a new BBC & ITV freesat+ receiver which has full recording facilities, including the ability to record, rewind and pause live Digital TV as you watch it, so you will never miss a thing again. So if you are looking to receive the very latest in free digital HD TV entertainment then the new BBC & ITV freesat system, which was launched Spring 2008, could be the answer! This new freesat HD system has been developed to provide greater coverage for the UK. Approximately 98% of all UK households are able to receive the satellite signal, and this provides digital viewing for those who are unable to receive the current Freeview signal. Furthermore, freesat HD provides super fast digital text and enhanced interactivity, with access to the latest national, local and world news, and even live sports results. To help you make the most of what you want to watch, the new freesat HD digital TV reception system has a built in TV programming guide, providing you with up to date listings seven days in advance of when your favourite shows are on. There is also digital subtitles and audio descriptions available. We install satellite dishes and freesat systems all across the UK. 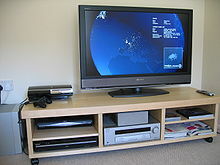 Our service includes the installation of HD TV equipment such as wall mounted flat panel screens. Home cinemas used to be the stuff of dreams, the preserve of the rich and famous. Luckily times have changed and they are now an affordable home luxury. With the film industry using more and more exciting technology to create special effects, to experience the full glory of a movie meant a trip to the local cinema. With that came the rising cost of a night out, not just the tickets but travel costs and of course snacks and drinks, which are an essential part of the enjoyment. Now home technology is catching up: 3D TV and surround sound are available for everyone to purchase and the latest movies are being released for home viewing earlier than ever. Copyright © 2012 A Hinxman. All Rights Reserved.